I still have more WRTA routes to cover, but I figured I’d start interlining the PVTA stuff in between them to vary it up a bit. Except…what’s this? Yes, my first PVTA review isn’t even a PVTA review, but an FRTA review! This is a system I’ve been wanting to ride for ages, and it absolutely met my expectations. FRTA has always struck me as a transit system that thinks it’s way better and more important than it is. 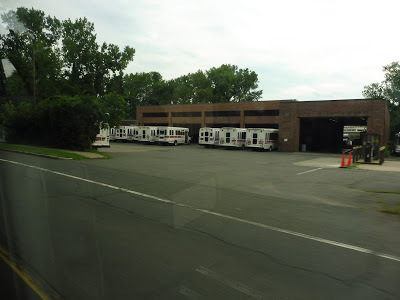 They have these sprawling routes that never run, hardly get any passengers, and go into the middle of nowhere, yet they all have fixed stops, shelters at stops to serve literally a single store, and, on a few of the routes, full-sized buses. Not to mention the agency has a beautiful website, a gorgeous modern transit center (which we’ll get to in another post), and an upcoming smart card system. Geez, all this for, like, six middle-of-nowhere routes? 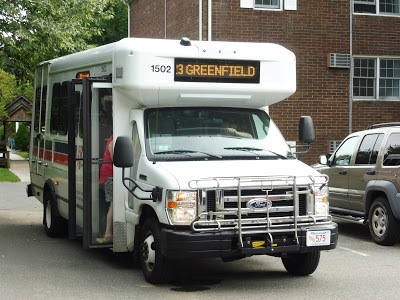 The point of the 23 is to connect to the PVTA’s 31 (which, again, we’ll get to in another post) and take UMass commuters to Greenfield. The route used to go all the way to Amherst proper, but now it’s cut back to Sugarloaf Estates, a housing development in Sunderland. 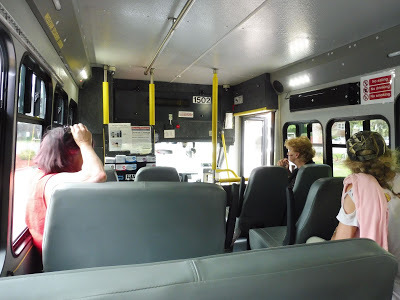 Sam and I got on the minibus from the 31, and with a few passengers on board, we were off. The entrance to the development. Past the center, it was again a mix of houses and farms. After going by a particularly large specimen of the latter, we entered the woods, which really was just trees aside from a few houses hidden behind long driveways. Next, the street became Montague Road, and the houses started to appear a little more often…then it was pure woods again. Wow, it’s pretty out here! 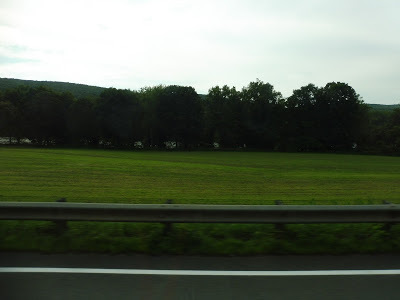 It became farmland after that, with huge fields stretching out before fading back into woods. Soon, the houses came back, but they were still far apart and set far back from the road. 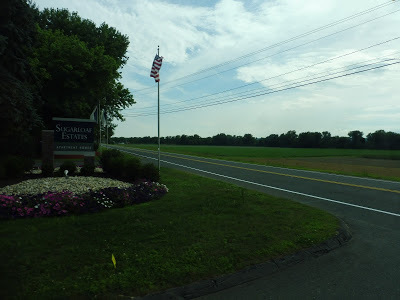 As we entered Montague, the street became Sunderland Road, and there was lots of farmland for a while. 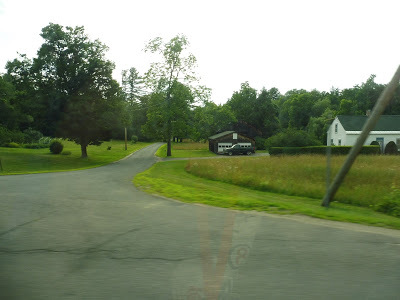 The name of the road changed again, this time to Main Street, although the farmland and woods didn’t exactly suggest anything “main.” However, eventually the houses became denser, and we arrived at Montague Center. What did it consist of? Uhhh…basically just a single tiny market, a common, and a library. It wasn’t much. Turning onto Federal Street at a cool-looking intersection. The pattern of farms, houses, and woods continued on, with one particularly long stretch of forest featuring a railroad bridge over the road. We also entered Millers Falls along this section. After some more houses, we went over a different set of railroad tracks, then curved around past a restaurant and an industrial building. As the houses suddenly became dense, we entered downtown Millers Falls by turning onto Main Street. This was a proper town center, although by “town center” I mean something like the lonely main street of some wild west town. 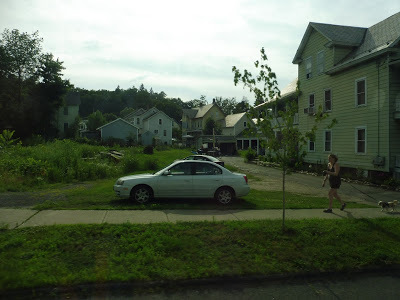 Next, we turned onto Franklin Street, going through a rather nice dense residential neighborhood. 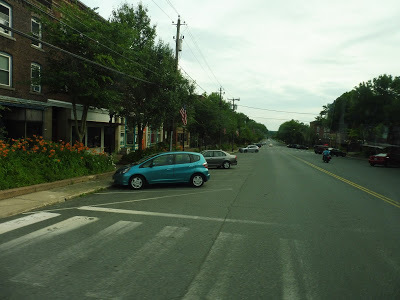 We turned onto Newton Street at the end of Franklin, then we headed south down Bridge Street, looping around back to where we started. We turned back onto Main Street but continued on it this time, until it became Millers Falls Road. The houses thinned out and we once again entered the forest. We reentered Montague and went through a brief industrial area surrounding the Turners Falls Municipal Airport. 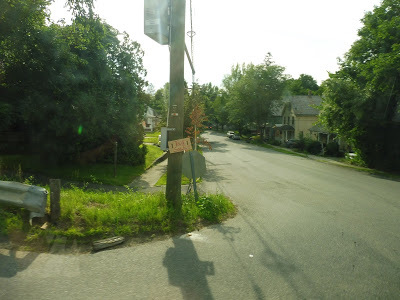 Next,we entered a residential neighborhood, but pretty soon after we arrived, we turned onto Cross Street in order to deviate to serve the…Turners Falls High School. Come on, FRTA, it’s summer! Don’t pull a GATRA on me! No no no no NO! We don’t need to serve this! 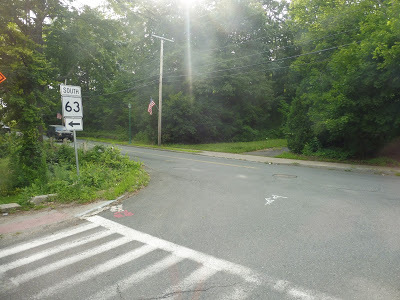 We returned to Millers Falls Road, continuing through the first generic suburban residential area on the entire route. Eventually, the street curved northward and became Unity Street. It took us past Scotty’s Convenience Store, which is considered a major timepoint in the schedule, plus it gets its own FRTA shelter! Union Street curved down a hill, then we turned onto the residential Park Street. It merged into 7th Street, then we turned onto L Street, going by more houses and even some apartments – it was pretty dense! 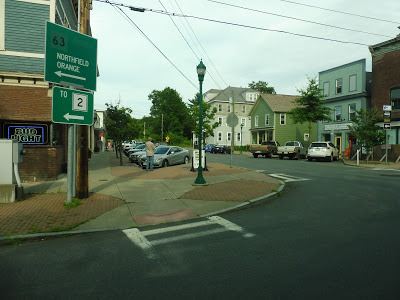 Next, we turned onto 3rd Street, then A Street, the main drag of downtown Turners Falls, and it was really interesting. A lot of the businesses were…hipstery! I never thought I would see anything like it out here! It seemed like a really nice downtown. There were more varied businesses as we continued down the street, as well as a park and a post office. After going by a little shopping plaza (another major timepoint), it became industrial, then we merged onto Montague City Road. 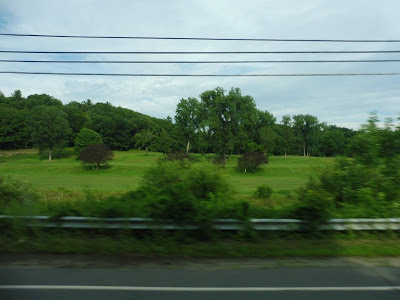 It was residential again, but one side of the road was occupied by a huge golf course. The course was eventually replaced by woods, but houses still occupied the other side of the street. 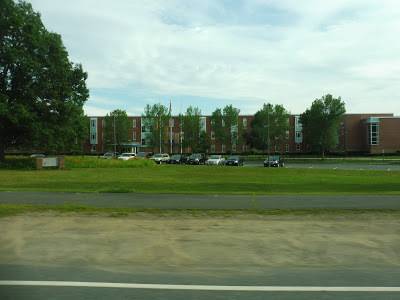 It stayed residential for a while until we passed a sizeable hospital, another major timepoint. 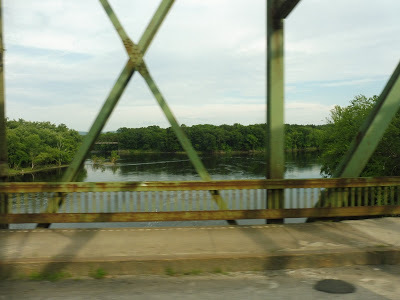 After some more houses, we went onto a really shaky, rickety bridge over the Connecticut River, taking us into Greenfield. It was a great view, but it was really hard to get a picture because the bus was shaking up and down! Man, I love the Connecticut River. The houses continued on the other side, although we also passed a recycling plant and some industrial buildings. 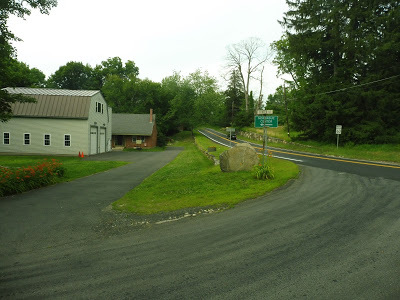 The road briefly became Cheapside Street as it went under two separate railroad bridges and alongside the Deerfield River. 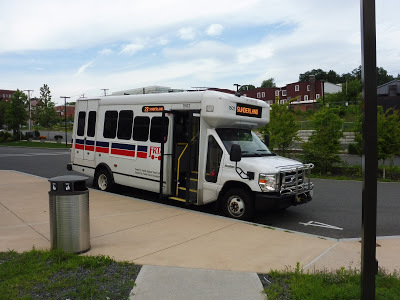 Next, it turned into Deerfield Street, where we went by some industrial buildings, including the FRTA garage, where a New Flyer Midi appeared to be sitting! 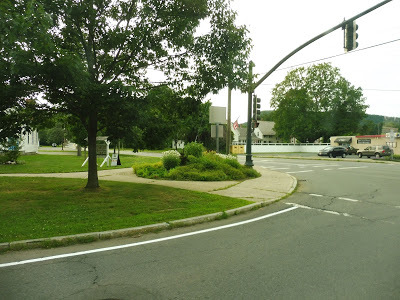 Ridership: I can only find ridership data from when the route went to Amherst, and at that point it got 11 riders per day from two trips – so about five per trip. Since they cut it back to Sunderland, the route gained two extra trips per day, and mine had five other people going out and three coming back. Honestly, for a rush hour-only minibus route that runs through the middle of nowhere…that’s not bad! Pros: The 23 serves an important purpose in that it connects towns in Franklin County to UMass for students and workers. The transfer to the 31 is easy and free, and many of the route’s riders use it. FRTA is changing the route to take a completely different road to Montague, skipping out on Millers Falls, which makes sense – it will speed up the run and get riders to where they’re going faster. There are other routes that already serve Millers Falls. Cons: Not much – sure, the ridership may be pretty low, and the route’s subsidies are high, but it’s still an important lifeline for UMass commuters. 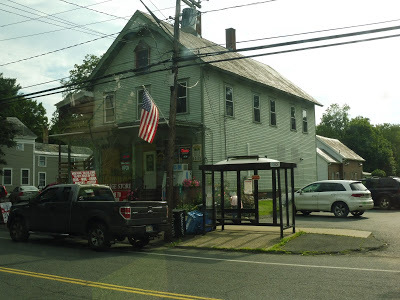 Nearby and Noteworthy: I really liked Turners Falls, from what I saw of it! This definitely isn’t the easiest way of getting there, though; buses on other routes run there every hour throughout the day. Wow, it’s actually a good route! Or, at the very least, an important one. I definitely can see why they only run this thing outside of rush hour, but when it does run, it gets well-used by people coming from and going to UMass. Plus, the ride is beautiful!